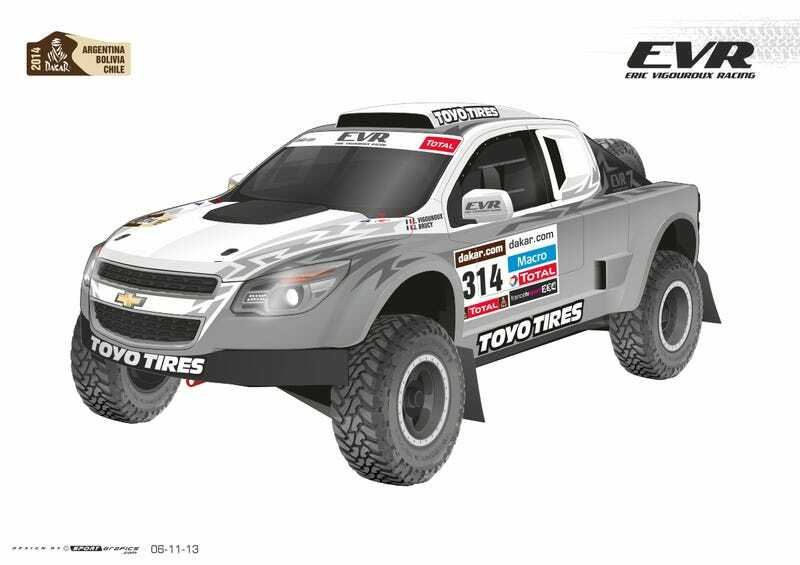 APPLE VALLEY, USA, November 8, 2013 - Eric Vigouroux Racing has announced their participation with two new developed pickup trucks in Le Dakar 2014 in collaboration with Jefferies Racing. Experienced Dakar pilot Eric Vigouroux from France, living in California will team up with American off road racing ace 'Ballistic' BJ Baldwin. The new pickup truck has been designed and built in cooperation with Jefferies Racing. The pair will drive the latest and technically most advanced desert racer, theEVR Proto VX 101 Rally Raid Concept, powered by a LS7 Corvette Racing engine, coupled to a Fortin sequential gearbox. Eric Vigouroux: "After several seasons with my Chevrolet Silverado for top honours in the past years we have decided to develop and build a totally new race truck. Based on our experience Jefferies Racing in California, USA, has constructed two competition vehicles. Despite Dakar 2014 being the first real competition for the EVR Proto VX 101 Rally Raid Concept, our goal is to show the world the potential of our team." Eric Vigouroux, Frenchman by birth but living in San Diego, USA, is a veteran off-road racer. In 2014 Eric will contest his 14th Dakar. Vigouroux has won almost every rally raid he entered the last four years. In 2010 he became FIA World Cup Champion in the 2WD category and last year Eric was the overall winner of the 2012 Rally of Morocco against all the factory teams. With fifteen years of experience, a professional team and a totally new, high-performance pickup, Vigouroux definitely has the potential to create some big surprises. BJ Baldwin is a very well-known rally raid driver in the USA and has competed in all different types of off-road racing. He holds four championships in the last six years with several race wins including the Baja 500 and he drove a HUMMER in 2010 in Dakar 2010. With great experience and having competed in over 500 desert races, BJ Baldwin can be reckoned to be a top ten finisher in Dakar 2014 and could win some special stages.